Worries over a fragile Turkish economy and the risk of contagion in Europe unnerved investors on Friday and sent the lira to a record low against the US dollar. The Turkish currency plummeted as much as 17% against the dollar, reflecting a range of concerns, including tensions with the United States and the unwillingness of Turkish authorities to raise interest rates. President Donald Trump, who imposed sanctions on senior Turkish officials earlier this month for their role in the detention of an American pastor, upped the stakes on Friday with a promise to increase metals tariffs on Turkey. Turkish President Recep Tayyip Erdogan was defiant. "Don't forget this: if they have dollars, we have our people, justice and God," he said. "We will come out of the economic war successfully." The rhetoric did little to calm markets. The lira, which has dropped almost 40% against the dollar this year, resumed its slide as Erdogan spoke. Rodrigo Catril, a senior currency strategist at National Australia Bank in Sydney, said investors are increasingly worried about rising inflation and the ability of the country's central bank — whose independence has been questioned by investors — to do anything about it. The central bank has been under pressure from Erdogan, who was re-elected in June, to keep interest rates low despite inflation that topped 15% in July. It went against market expectations and left policy unchanged at its more recent meeting. That may have pleased Erdogan, but economists say the central bank is now likely to be forced to take emergency action. "There are reasons to think that emergency interest rate hikes during the current currency crisis might only provide fleeting relief," said William Jackson, chief emerging markets economist at Capital Economics. "It's not clear that Turkey will be able to step back from the brink this time around," he added. The government has already slashed its growth forecast for this year to 4% from 5.5%, but economists warn the slump will be much worse if confidence is not restored quickly. "A recession and a debt crisis that would force Turkey to implement capital controls and ask for an [International Monetary Fund] bailout cannot be ruled out anymore," said Carsten Hesse, European economist at Berenberg. Erdogan appears determined to fight. On Friday, he urged the Turkish people to exchange dollars and euros for lira in order to defend the currency. Yet other forces were working against the lira. Trump said in a tweet on Friday that he would hike taxes on metal from Turkey. "I have just authorized a doubling of Tariffs on Steel and Aluminum with respect to Turkey as their currency, the Turkish Lira, slides rapidly downward against our very strong Dollar! Aluminum will now be 20% and Steel 50%. Our relations with Turkey are not good at this time!" he said. It was not immediately clear when the tariff hikes would be imposed. 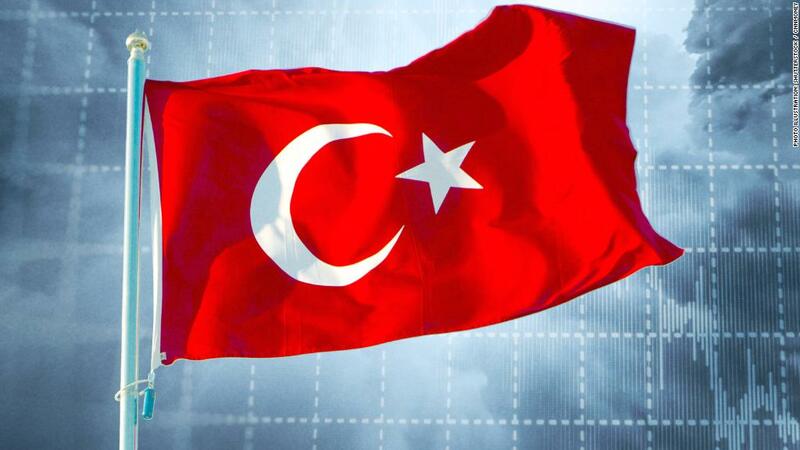 Investors concerns have turned in recent days to the health of Turkish banks. The Financial Times reported that the European Central Bank is concerned about eurozone banks' exposure to Turkey because of the tanking lira. The ECB declined to comment. Data from the Bank for International Settlements show eurozone banks have loans worth over $150 billion in Turkey. Spanish, French and Italian banks are the most exposed. Shares in some of Europe's biggest banks were hard hit on Friday. Italy's UniCredit (UNCFF) shed 5.6% and Spanish lender BBVA (BFR) dropped 5.5%. France's BNP Paribas (BNPQF) was off by 4.3% and Deutsche Bank (DB) fell 5.3%. 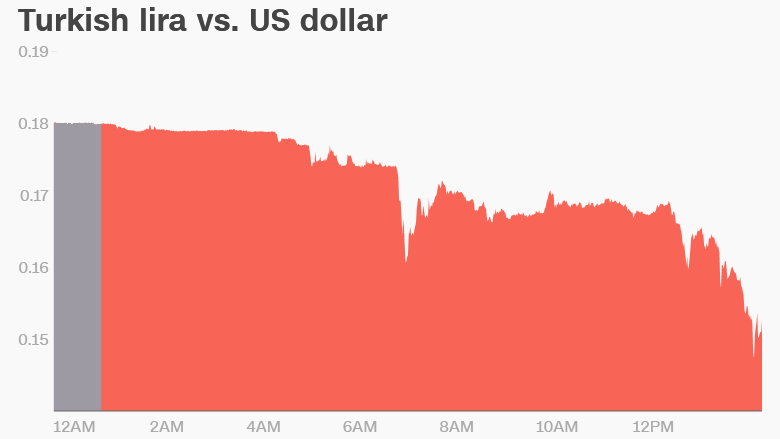 The euro was trading 0.9% lower against the dollar on Friday. The Turkish economy has expanded rapidly this year compared with 2017. But its growth in recent years has been fueled by construction financed largely by foreign investors. "The decline in the Turkish Lira and rising borrowing costs cause a big headache for many Turkish companies, as they have borrowed in foreign currency despite receiving revenues in local currency," Hesse said. -- Gul Tuysuz and Chris Liakos contributed to this report.